For those wondering what are the signs of cancer in cats, the answer is a rather long list of potential symptoms. Responsible pet owners should definitely look out for these behaviors as well as pay attention to any other unusual behavior that their pet exhibits. As a pet owner, you know how your animal usually behaves, so any odd behavior should be a warning sign. Cats exhibit both physical symptoms and behavioral symptoms that can indicate cancer. Let’s go through each of the symptoms one by one so that you have a much better idea of what to look for. Weight is definitely one of the things that you want to look at when it comes to determining whether your cat has cancer or not. But it can be difficult to tell because the weight loss may be gradual or it may be sudden. In addition, it could be weight gain instead. Gastrointestinal cancer can cause increased appetite and weight gain as well as weight loss; a really good warning sign is if your cat seems to be eating less but still gaining weight. If your cat avoids social situations and hides out in small dark places that can be a sign that there’s something seriously wrong. Cats know when they are sick and they will seek out a private place to live out their last moments. However, this doesn’t always lead to cancer as there are many things that can make your cat want to hide out. Look for unusual bleeding as a symptom of cancer. 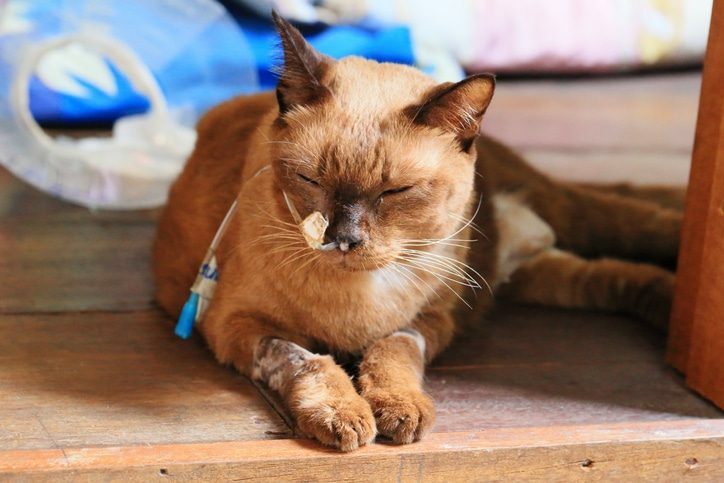 Nosebleeds are not common in cats unless they have something wrong with their nasal passages or a nasal tumor. Unusual bleeding of the mouth is also a symptom. There are other oral symptoms that you want to keep an eye out for as well. These include sores, lumps, discoloration of the gums or bad breath. Make sure that you inspect the inside of your cat’s mouth regularly. This is something that many pet owners forget. If your cat has discharge from the eyes, you may want to see your vet, as this could mean an eye tumor. The same goes with constant discharge from the nose. Diarrhea can be a sign of cancer, as can other irregular bathroom habits like blood in the stool or increase in the number of times your cat goes to the litter box during the day. Any time that your cat has a seizure it is serious. You want to see your veterinarian right away. A seizure can mean a tumor in the brain or spinal region. Skin sores and lesions that do not go away could be a sign of skin cancer in cats. If you believe that your cat is in pain, then you want to see your veterinarian right away. If your cat is usually affectionate but now complains when being picked up, then you definitely want to do whatever you can to help them. If you believe your cat has cancer, we recommend our Advanced Immune Restoration Protocol, it’s highly effective and comprehensive. An exact diagnosis is not necessary as this protocol is beneficial for any cat, especially aging cats or ones that may be sick. The combination of essential fatty acids and sulfur bearing proteins, both in our protocol, have been studied by world renowned biochemist Dr. Johanna Budwig, can super charge the immune system helping the body fight the cancer cells. This entry was posted in Cat Cancer. Bookmark the permalink.